Commercial and institutional work at PLAN/ ONE ARCHITECTS, Wyoming’s largest firm, was good preparation for responsible professional licensure. She managed the BIG HORN FEDERAL BANK in Lovell, developing a full C.D. set with specifications, fee analysis, code study, and specialty equipment. 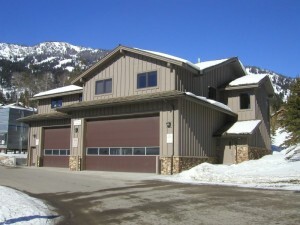 Construction administration for of the School District’s Vehicle Maintenance Facility, Teton Village Fire House (Pictured Right) and the $8.5M Jackson Hole Mountain Resort Operations Facility, where difficult soil conditions in seismic zone 3 demanded a non-conventional foundation system. Unusual mechanical and civil requirements, such as winch cat lifts and high volume storm drainage, as well as the complex politics of a developer financed, mixed use project, governed by various entities made these last two assignments uniquely challenging. This entry was posted in COMMERCIAL, NEW CONSTRUCTION on December 14, 2012 by Rachel Ravitz.